Searching for new directions to share his photographs, Hermann created 'LifeNotes'. 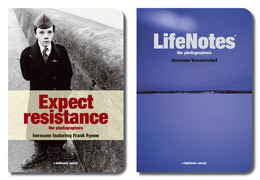 LifeNotes are small booklets who's covers show one of Hermann's photographs. Their story can be found on the inside of the cover. The inside pages are open for the owners own use. LifeNotes can also promote work of other artists. Julie Brown recently used LifeNotes to interact with the audience with her project '(Ant)Arctica Speaks'.